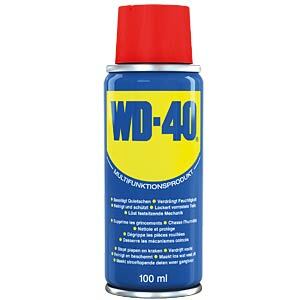 WD-40 is silicone, resin and PTFE-free. It infiltrates rust layers, loosens stuck mechanisms and seized vehicle and machine parts. Removes stubborn dirt, eliminates moisture from electrical contacts and prevents leakage currents. What's more, WD-40 leaves behind a thin protective film that prevents moisture and rust from forming again on metal parts. Loosens stubborn dirt, oil, grease and adhesive residues and makes them easy to remove. Leaves behind a beneficial protective layer. For optimal running of moving parts, eliminates and prevents squeaking and creaking. No silicone, therefore no adhesion. Infiltrates rusts layers, loosens jammed metal parts, screws and nuts. Leaves behind a thin protective film that prevents moisture and rust from forming again on metal parts. H304May be fatal if swallowed and enters airways. H336May cause drowsiness or dizziness.